1,259 deaths, 9,000 injuries and 1.6 million homeless victims in a country with a population of approximately six million. 150,000 homes were destroyed; 185,000 were damaged. Highways and roads were heavily damaged ). Eight hospitals and 113 of 361 health facilities were severely damaged representing 55 percent of the country’s capacity to deliver health services. Nearly 35 percent of all schools were affected (1,681 out of 4,820). This BBC story from January 13, 2001 describes the aftermath of that first earthquake ten years ago. Worst hit was the neighborhood of Las Colinas, close to San Salvador, where a hillside gave way, burying the homes below it and killing more than 585. Working to rescue the survivors of the quake were the dedicated volunteers of Comandos de Salvamento. You can read the reflections of some of those volunteers on this tenth anniversary here. There is also a photogallery of the rescue work here. Despite the passage of ten years, efforts to prevent the possibility of a recurrence of such a disaster are incomplete and partial. The tragedy was not just the earthquake, but an ineffective government response. Efforts to mitigate risk in many areas of El Salvador are essential -- last year there were more than 2300 seismic events in El Salvador, and more than 100 were strong enough to be felt by those who live there. Consider as well the images from this photogallery at El Faro, describing a group of buildings seriously damaged in the 1986 earthquake. The buildings should have been demolished long ago, but now more than 80 families live among the precarious ruins. 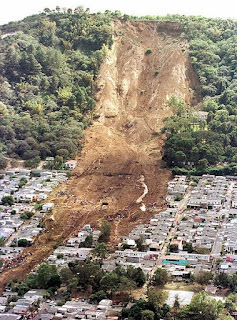 For more information and images on the 2001 earthquakes, you can visit a multimedia special section of La Prensa Grafica. take a moment to watch my free ads site.